From 5,000-1 outsiders to champions with two matches to spare - the Leicester City story is surely the most remarkable in Premier League history. Here, we take a look at how they defied the odds in a transformation that took them from relegation favourites to title winners. A 4-3 defeat at Tottenham on 21 March 2015 was Leicester's seventh Premier League game without a victory and left them seven points from safety with nine games remaining. A late Andy King winner in a 2-1 victory over West Ham kickstarted their revival - and they have not looked back since. At the start of this season the Foxes picked up where they left off in May, a 4-2 opening-day win over Sunderland taking them to the top of the table. They stayed there for two weeks before consecutive draws against Tottenham and Bournemouth saw them slip to third. That was supposed to be the start of their slide down the table - but it never happened. In fact, Leicester did not drop below sixth place all season and, after moving to the top again on 11 January courtesy of a 1-0 win at title rivals Tottenham, they would not relinquish that position for the rest of the season. Their form would enable them to clinch the title with two games to spare. But even if they win their remaining matches, they will have won the league with fewer points than any of the previous five winners. Their success, of course, has owed much to striker Jamie Vardy, the Football Writers' Footballer of the Year and PFA Player of the Year Riyad Mahrez, who have proved themselves a deadly combination, particularly when it comes to scoring goals. It also helped that manager Claudio Ranieri - previously nicknamed 'The Tinkerman' for his methods during his time at Chelsea - regularly named the same starting XI. In fact, Leicester used fewer players than any other team. It is 21 years since any team other than Arsenal, Chelsea, Manchester City or Manchester United won the top-flight title. And in an era of ever-increasing television revenue, where the latest deal is worth £5.136bn, it was considered unthinkable that any team could break the dominance of the traditional elite clubs. Yet Leicester have defied financial logic. Give them a pay rise! The most recent published figures for Premier League wages come from the 2015 Annual Review of Football Finance, published by Deloitte's Sports Business Group. They relate to the 2013-14 season, when Leicester (as well as Watford and Bournemouth) were Championship clubs, but the figures give a sense of the huge disparity in budgets between Leicester and the Premier League's biggest payers. Leicester's wage bill has since risen from £36m to £57m, but that it is still only around a quarter of Manchester United's from two seasons ago. If logic dictates that Leicester should have had little chance competing with the Premier League's biggest clubs, what hope do they have when they face the best Europe has to offer in next season's Champions League? The Foxes' statistics are a world away from those of two teams who have already clinched two of Europe's major titles, Juventus and Paris St-Germain, and another on the brink of securing theirs, Bayern Munich. 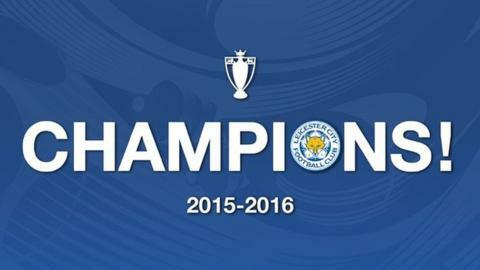 In winning the Premier League, Leicester became the first first-time winners of England's top-flight title since Nottingham Forest achieved the feat under Brian Clough in 1978. Europe's other major leagues have all had more recent first-time winners, though it is 25 years since a previously title-less team enjoyed success in Italy. Leicester's Twitter account has 519,000 followers - that's around 7m fewer than Arsenal, 2.7m fewer than Manchester City and 900,000 fewer than Tottenham. But it has been the Foxes who have been the talk of social media during the title run-in, far outstripping their rivals. Their title win on 2 May was off the scale.